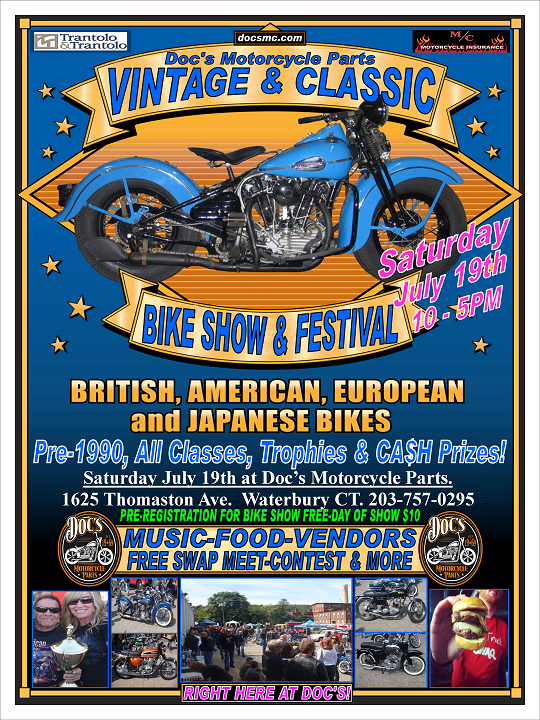 Saturday July 19th from 10-5pm, Doc’s Motorcycle Parts of Waterbury will be have it’s 1st ever Vintage and Classic Bike Show. All Pre-1990 Makes and Models Welcome. Over 12 Classes with Trophies and Cash Prizes…. Peoples Choice will take home $500 CA$H!! Have some old parts or really any parts, there will also be a FREE SWAP Meet, so get those old parts out and set up to sell. There will be plenty of FUN, with MUSIC-FOOD-VENDORS-CONTEST and MORE!!!!! PRE-REGISTER YOUR MOTORCYCLE NOW FOR FREE BY CALLING 203-757-0295 OR STOPPING INTO DOC’S!